Newstalgia Reference Room with a JFK Press Conference from June 7, 1962. Among the topics discussed - Taxes, The Budget, Medicare and Politics. We forget how often President's used to hold news conferences. During the JFK years is was almost every week. This Press Conference, from June 7, 1962 covers a wide range of topics. The budget, the recession, inflation, taxes and of course Medicare, which was foremost on JFK's agenda in 1962. 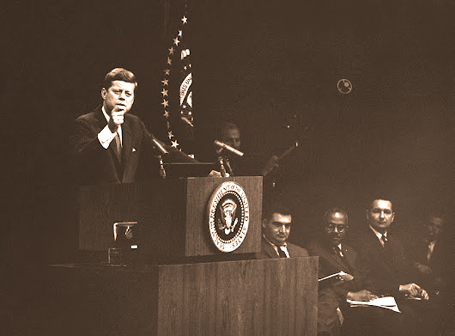 President Kennedy: "Good afternoon. I have a brief preliminary statement. I would like to say a few words about our economic outlook and program. I think most financial experts have realized for some time that an overpriced market could not hold up once investors recognized that inflation was ending. Price-earning ratios which averaged on Dow-Jones 23 to 1 could not be justified unless there was heavy inflation in prospect. And we have been working to prevent inflation, which gives a very misleading and spurious picture of economic health. We must not permit the effects of this adjustment, however, to hamper the growth rate of our economy, with which we have, as you know, not been fully satisfied. While our recovery from last year's recession has been a good one, production, profits, and employment are at alltime highs, and the prospects for continued economic expansion remain favorable. In view of corporate and consumer cash on hand, we should take every appropriate step to make certain that recovery is stronger and longer than before and is not cut short by a new recession. Taxation: In the first place, our tax structure as presently weighted exerts too heavy a drain on a prospering economy, compared, for example, to the net drain in competing Common Market nations. If the United States were now working at full employment and full capacity, this would produce a budget surplus at present taxation rates of about $8 billion this year. It indicates what a heavy tax structure we have, and it also indicates the effects that this heavy tax structure has on an economy moving out of a recession period. One: A $1,300 million tax credit of 8 percent on new investment in machinery and equipment, which will increase the typical rate of potential profits on modern plant expansion in this country to the same extent, for example, as a 20 point reduction in corporate income taxes, from 52 to 32 percent on the profits to be realized from a new 10-year asset. The tax bill containing this stimulus and offsetting revenue measures has been before the Congress for well over a year. And I am hopeful, particularly, that it can be passed very shortly, because one of the areas of concern in the economy has been the slowness of plant investment, and I think that if we can settle this matter of the tail credit quickly, I think it can have a most stimulating effect on new plant investment this year. Two: Administrative revision of the Internal Revenue guidelines on the economic life of depreciable assets, to make them more realistic and flexible in terms of actual replacement practices. These revisions to be issued within the next month will also make over $1 billion in added cash reserves available for additional business investment and, thus, these two actions combined, which we hope will be taken in the next 30 days, constitute in effect a tax cut for American business of over $2.5 billion. Three: A comprehensive tax reform bill which in no way overlaps the pending tax credit and loophole-closing bill offered a year ago will be offered for action by the next Congress, making effective as of January 1 of next year an across-the-board reduction in personal and corporate income tax rates which will not be wholly offset by other reforms - in other words, a net tax reduction. Four: I have asked the Congress to provide standby tax reduction authority to make certain as recommended by the eminent Commission on Money and Credit, that this tool could be used instantly and effectively should a new recession threaten to engulf us. The House Ways and Means Committee has been busy with other important measures, but there is surely more cause now than ever before for making such authority available. Five: I have asked the Congress to repeal the 10-percent transportation tax on train and bus travel, resulting in a tax saving of $90 million a year, and to reduce it to 5 percent on airlines. Action on this tax package will provide our economy with all the stimulus and safeguards now deemed necessary, and I hope such action will be forthcoming. Mention should be made also of other measures already pending before the Congress which would be of immediate help to our economic expansion and our unemployed workers. A bill to help youth employment - and one out of every four of our boys and girls out of school under 20 are unemployed - a bill to help youth employment has been pending before the Rules Committee since March 29. I hope action can be taken on it. A bill to authorize Federal, State, and local public works this year in areas of heavy unemployment and to provide standby authority for the future has already passed the Senate. Inasmuch as last year's temporary unemployment compensation program has benefited no additional unemployed since April 1, a pending bill to extend that program for 1 year should be passed by the Congress before they go home. Every week thousands of people find their unemployment compensation exhausting, must go on public assistance, and this should be a matter of great concern to all of us. Improvements in our welfare program to help those at the bottom of the economic ladder passed the House on March 15. Other pending bills - the trade bill, the pay reform bill, and others - will all have a beneficial effect on our economy once they are enacted by the Congress. There is no need for this country to stand helplessly by and watch a recovery run out of gas. We have a program to boost it and I hope that all those who are concerned about their stocks or their profits or their jobs will help us get action on this program. I have full confidence in the basic strength and economic potential of this country and the free world. We in the United States, business, labor, and the government, all of us working together, rather than at cross purposes, must rise to our responsibilities to maintain the forward thrust of our economy. The economic productivity and potential of the United States is the heart of our strength. Unemployment last month declined. Consumer income has been rising rapidly. New homes are being built at a remarkable rate. And this administration intends to do its full share of the task required to realize our full economic potential." Here is that Press Conference, live as it happened and broadcast over NBC Radio (along with everyone else), on June 7, 1962.